For decades, real estate agents had only two tools of the trade; the phone and the newspaper. But a new wave of house hunters is changing the way REALTORS® are using phones and advertising to real estate consumers – the millennials. Millennials is a generation of people who do not want to talk over the phone. They do not go to the store to buy newspapers and check out the classified sections in them. They want texts. They want social media. They want to interact with businesses virtually. Within the next 5 years, millennials are expected to take a greater role in the housing market. Their preferences will also start to shape the way real estate professionals do business. Realizing this, real estate agents are educating themselves on millennial interests and buying habits. They are making “marketing to millennial” their top priority. They are also building real estate internet marketing campaigns that are specifically targeting this powerful group. Last year, over 75% of consumers accessed property listings and information online – rather than through traditional methods – using smart phones, laptops and tablets. As well, over 80% of consumers accessed real estate information through devices that fit in their pockets. Real estate companies have chosen to move with consumers, shifting their focus to listing properties on their own websites and real estate portals and to using social media platforms and search engines to bring in quality leads. They have also been developing responsive and mobile-friendly websites/apps and advertisements to ensure that searchers can easily find the information they need anytime, anywhere, on any device. Real estate online marketing is now being applied by almost all real estate agents looking to maximize the leverage of reaching out to the target users. Real estate is very paper heavy, with many documents to keep track of both internally and externally. For most real estate companies, electronic document management systems are either already in place or in the process of being implemented. Agents are saving valuable time and resources by managing their documents using internal digitizedCRM and file management systems. There are multitudes of document-sharing and digital collaboration tools like Dropbox and Google Drive and each of them help REALTORS® adapt to the changing market in 2019. Millennial buyers are doing their research online and are entering the housing market well-prepared. They are relying on real estate professionals not to introduce them to homes, most of which they can find online, but to show them what cannot be researched: neighborhoods that are being built, which properties stand to gain value in the coming years and guidance when it comes to negotiations and renovations. To adapt to changing markets in 2019, real estate professionals are offering consumers a robust mobile-friendly IDX that helps them search through all the properties quickly in targeted areas. They are also producing solid articles on their blogs that truly answer consumers’ common questions and make them look authentic and authoritative. The millennial generation is a generation that is motivated and persuaded by online reviews and word-of-mouth marketing. Over 80% of millennial consumers trust online reviews written by other consumers as much as they trust recommendations from personal contacts. As well, nearly 75% of millennial consumers cite word-of-mouth marketing (e.g., recommendations from friends) as a top influencer in their purchasing decision. 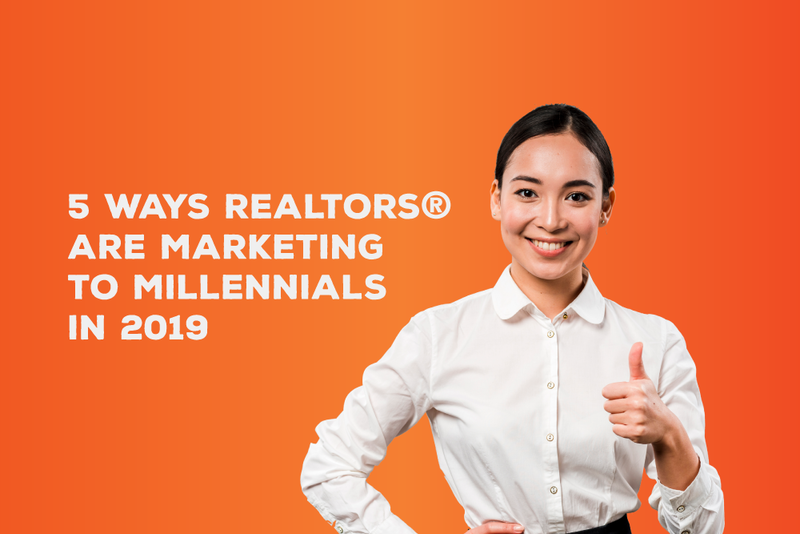 To attract more millennial clients, real estate agents are asking current and past clients to send testimonials or to write reviews on review websites (e.g., Facebook, Google, Yelp). Online reviews help real estate professionals build instant trust with millennial and overcome any objections that they may have by featuring these powerful social proof statements. Millennial home buyers tend to put more emphasis on finding a local community and neighborhood that fits their lifestyle, rather than finding the perfect home with top-rate amenities. They care more about whether or not local transportation is available. They want to obtain a list of local restaurants and large corporate chains that they can frequent when they move in. Regardless of whether or not they have kids, they also want to know about the schools and how they compare in academics to other schools in surrounding areas. To really connect with millennial buyers, real estate professionals are investing some time and money to building community videos of their targeted area. The videos highlight local restaurants, bars, music venues, bike/hiking trails and other fixture that millennials might be interested in. The videos are then posted and promoted on social media channels and websites to ensure maximum reach. Reach out to one of our Real Estate Online Marketing Specialists to learn more about how we can help you grow your real estate business online.